SkyTeam, the global airline alliance, has appointed a new leadership team. Perry Cantarutti has been named as Chief Executive Officer and Michael Wisbrun takes over as the Chairman of the Governing Board. SkyTeam, the global airline alliance, today officially opened its exclusive lounge at Hong Kong International Airport. The fourth in a growing offering of SkyTeam-branded lounges around the world, it is available to First and Business Class passengers and Elite Plus members flying on all 12 member airlines serving the airport. SkyTeam, the global airline alliance, has teamed up with music streaming service, Spotify, to launch an exclusive 15th anniversary SkyTeam playlist. Available to stream on any compatible device, the playlist features 15 songs that reflect the diversity of the alliance and provide a relaxing musical background to customers’ global travels. SkyTeam, the global airline alliance, has been named ‘Best Airline Alliance’ in Latin America. The ‘Best of Travel Annual awards’ by Latin Trade Magazine recognized the alliance’s customer-focused achievements in the Latin American and Caribbean region and comes during SkyTeam’s 15th anniversary year. SkyTeam, the global airline alliance, is investing in more ways to ensure that travel throughout its 1,057 destinations is as seamless as possible for the 602 million passengers that fly on its airlines each year. The airline alliance is celebrating 15 years since it was founded in New York City in 2000. Launched by four founding members - AeroMéxico, Air France, Delta Air Lines and Korean Air – today SkyTeam comprises 20 leading global airlines offering a comprehensive series of customer-focused programs around its worldwide network. SkyTeam, the global airline alliance, has announced the intended retirement of Chairman Leo van Wijk, with effect from the November 2015 Governing Board meeting. Mr. Van Wijk has been the Chairman of the alliance since June 2007 and will be succeeded by current SkyTeam Chief Executive Officer, Michael Wisbrun. Following a successful pilot yoga program in SkyTeam’s Exclusive Lounge at London’s Heathrow Airport, the global airline alliance has launched two new Yoga tutorials for passengers to enjoy wherever they are in the world and even at 30,000 feet. SkyTeam, the global airline alliance, has been announced ‘Airline Alliance of the Year’ in the 2015 Air Transport News awards. The award comes in SkyTeam’s 15th anniversary year, as the alliance continues its rollout of customer-focused initiatives across its global network. SkyTeam, the global airline alliance, has formally opened its new Exclusive Lounge at Sydney Airport. The alliance’s presence in the Australian market has been growing steadily and now offers over 80 weekly departures from Sydney International Airport operated by China Airlines, China Eastern, China Southern, Delta Air Lines, Garuda Indonesia, Korean Air and Vietnam Airlines. 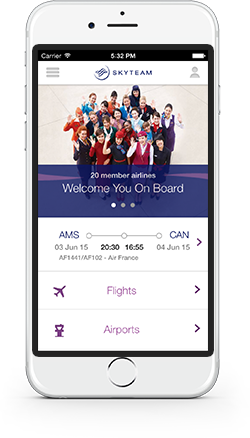 SkyTeam, the global airline alliance, has launched its WeChat account to facilitate interactions with its customers in the Greater China region and across the globe. Delivering useful information and services for customers, the WeChat account complements SkyTeam’s existing presence on Sina Weibo.